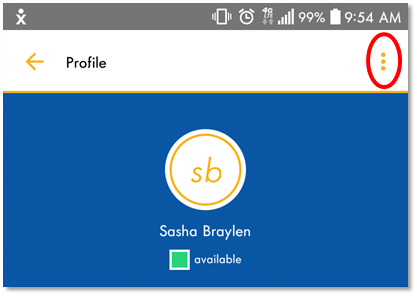 All Contacts in your organization that exist on the Nextiva system come pre-loaded into the Directory when first logging in to the Nextiva App. The Directory contains all of the Auto Attendants, Call Centers, Call Groups, and Users that are on the Nextiva system. While on the Contacts screen, click the drop-down arrow in the upper right (Figure 1-1). 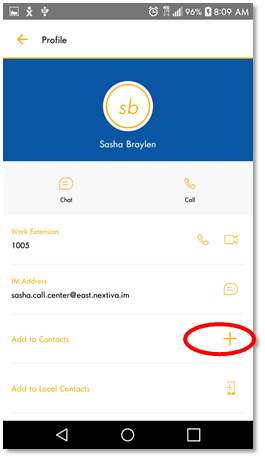 Selecting the drop-down will open both Contacts menus, divided into their own sections outlined below. Select Directory under the Contact Directories section (Figure 1-2). 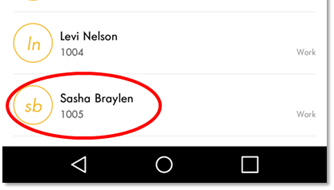 Communicator Contacts: A short Contact list, typically used for instant messaging and Team Presence, which shows personalized frequently contacted numbers. For more information about starting a chat, click here. 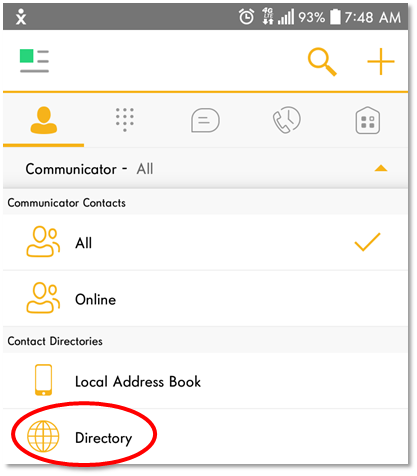 Contact Directories: Contacts in both the Local Address Book and the Nextiva Directory. 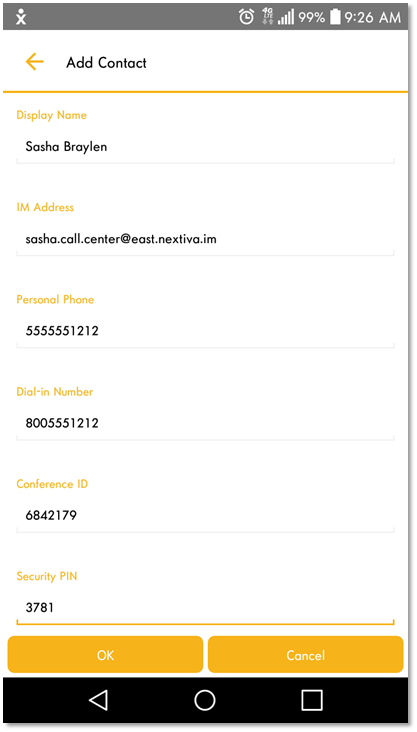 These Contacts are fully customizable, and do not have to be on the Nextiva network. When going off-net, Team Presence and video chat will be unavailable. Once in the Directory, locate the Contact and select them (Figure 1-3). 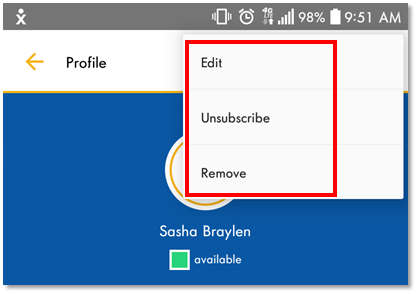 Once the Contact Profile has opened, click the plus sign to the right of Add to Contacts near the bottom of the screen to add the User to the Nextiva App Contacts List (Figure 1-4). Note: Selecting Add to Local Contacts will add the Contact to the local cellular phonebook. Manually inputting Contacts is required if the Contact being added is not in your organizational Directory. The new Contact can be part of any Nextiva system to take advantage of Team Presence and chat, as well as any contacts outside of the network you wish to contact through the Nextiva App. 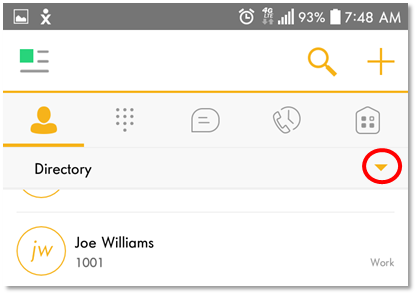 While on the Contacts screen, click the plus sign in the upper right corner (Figure 2-1). Select the OK button to save the new Contact (Figure 2-3). Once the Contact is saved, the Contact will be located in the Communicator Contacts – All section for easy access. There are two levels of Contact removal. 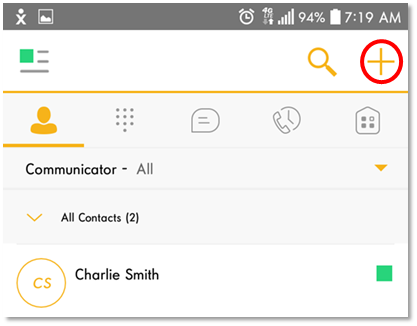 To access these levels, locate the Contact in the Communicator Contacts – All section and select the Contact to open up their Profile. In the upper right corner, select the ellipses to open the menu (Figure 3-1).